Driving north for an hour from the city of Liberia in Costa Rica, past skinny cows in postcard-green meadows, one wonders if civilization is ever going to reemerge, and then the taxi driver slams on his brakes. Driving north for an hour from Liberia, Costa Rica, passing skinny cows in postcard-green meadows, one wonders if civilization is ever going to reemerge. Then the taxi driver slams on his brakes. He comes to a smoking halt behind a row of eighteen wheeler trucks at a standstill spanning as far as the eye can see, inching forward like a row of dinosaurs migrating north. The driver makes the sign of the cross and then whips into traffic going the wrong way, laying on his horn, and swerves into a ditch to avoid being hit head-on by an oncoming car. The taxi tilts onto two wheels, sending the driver's little plastic dashboard saint jiggling like a mad Hula girl, and then recovers, squeezing back into the center of the highway just in time to avoid a farmer driving a donkey cart. 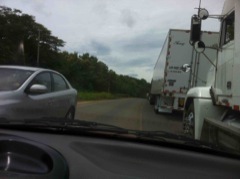 We whiz past miles of unmoving trucks like this until we reach a shoddy outpost of concrete and chain-link where guards in black fatigues with M16s signal for us to stop. Welcome to the border. The border at Peñas Blancas, or La Frontera as the locals call it, is the only official entry point between Costa Rica and Nicaragua. It's considered the gateway between North and South America along the Inter-American Highway that spans from Panama to Mexico, and goes all the way to the tip of Argentina as the Pan American Highway. A jaunt over the border is at best a sweaty and shuffling two-hour inconvenience, at worst a full-day Dantean undertaking. You take your place in a queue of hundreds of sweltering backpackers, bug-bitten and hungover, Nicaraguans returning home for the holidays from their jobs swinging machetes in the fields and expats doing the "border shuffle" -- the term for leaving the country and immediately turning around and reentering just to get another 90 day travel visa. They fan themselves with the morning edition of La Nación and inch forward to get their immigration papers stamped at a glassed-in counter. "Mango mango mango! Se vende mango!" A fruit vendor with a basket on her head shouts over the din. Every free space seems to be filled with flies, fat money changers and "hawks" who offer to help you over the border for a fee of about $10. And it actually works -- these guys will usher you right to the front of the line, dodging razor stares and catcalls from those you're cutting, by slipping a 20 into the security guard's palm. After getting your passport stamped you drag your suitcases across five hundred yards of dust clouded no-man's land, and then repeat the process to enter the next country. It's not expensive to enter or exit -- only about $13 for tourists on the Nicaraguan side and even less in Costa Rica -- except if you tally the emotional damage and time of your life that you'll never get back. On the Nicaraguan side you go through passport and luggage inspections at a series of rickety wooden tables and bizarre concrete checkpoints. It seems like they grab random people off the street, give them a yellow vest and instruct them to stand around looking semi-official while checking the passport of anyone who walks by. They're looking for illegal drugs going north or illegal people going south and their scrutiny reflects this; to enter Costa Rica your passport is supposed to be valid for at least six months longer and you cannot come into the country without an outbound ticket, but in Nicaragua they mostly want to check your bags for contraband. However, the enforcement of those regulations is fickle, depending if the officer on duty is in a good mood because his soccer team won the night before. The best times to cross the border are on weekdays and afternoons, but never during Christmas, Easter or during national elections if you don't want to wait all day. Buying a bus ticket on TransNica or TicaBus, considered expensive at $25, will allow you to bypass most of this hassle in air-conditioned comfort and they'll even collect your passports to take care of the visas while you wait in the shade with an orange Fanta. Passage on a local "chicken bus" to the nearest cities of Liberia or Revis in Nicaragua will only cost about $5 but could be a daring adventure unto itself. Conditions seem more desperate on the Nicaraguan side -- right over the border rows of shanties emerge, a bazar of stands serving gallo pinto, rice and beans, with Toña beer. If you happened to be in the market for a leather belt, a pirated copy of Shrek 3 or an inflatable dolphin for your swimming pool you'd be in the right place. "Hey man, what's up man? You are Canada, no?" a little kid in a leather jacket gets your attention. Nicaraguans live a hard life but are incredibly warm once you get past that, so just smile or say hi to a kid and you've made a new best friend. A pickup truck packed with border police zips by, lights blazing. Here's the game behind the game: Peñas Blancas is the single largest drug transit point in the Americas. The majority of the cocaine that ends up on a street corner near you in the US moves from Colombia to the shores of Costa Rica, then runs up through this border crossing into Central America and overland to Mexico. You would never guess that an international game of cat and mouse worth tens of billions of dollars every year is going on right at this border. Last year alone they confiscated 10 tons of cocaine at La Frontera, smuggled in the fake gas tanks and hollowed-out tires of the trucks. Now you can understand why each eighteen wheeler is searched so carefully and they're backed up for miles, sometimes waiting three days to cross. But none of this is apparent to the happy tourist heading south to Tamarindo to surf or north to charming San Juan Del Sur for sun and good vibes. The border crossing is completely safe for them other than the occasional petty theft or pickpocketing. I've been over the border five times myself and talked to countless border crossers, but one story in particular I have to share. Mr. Blake Cash, an expat from Texas who owns a bar in San Juan Del Sur, was crossing the border south with his girlfriend Whitney Bell when a scrappy thief grabbed her iPhone out of her open purse and tried to run away with it. Whitney held on for dear life and yelled for Blake, who was about 20 yards away. He sprinted over just as the thief got free and took off with the phone -- but caught up and took him down with a flying tackle that would make Ray Lewis proud. They fell to the dirt and wrestled for the phone but the thief wouldn't let it go. Blake had to "persuade" him with a few slams of his face into the ground and eventually the thief let go and scampered off. Luckily, Whitney wasn't hurt, just scared, and the only casualty was a broken phone screen. But Blake had bigger problems -- he looked up at an ominous crowd surrounding him: Nicaraguans, Costa Ricans and local touts, hawks and vendors who had witnessed the whole thing. His heart jumped into his throat as they closed in, seemingly to avenge their beaten and bloodied compadre, and he prepared to fight for his life. But instead someone reached down and offered him his hand. He took it and they all helped him up, brushed him off and made sure he was ok. A smile broke out on his face as the crowd began cheering, clapping and high fiving him for thwarting the thief and protecting his girlfriend's honor. Whitney and Blake walked on through the border as the crowd parted, every backpacker, border-worker, tourist and Latin national cheering and patting him on the back. Way to keep it classy, Peñas Blancas. The last thing you'd want to do is get a bad name. To read more about Norm Schriever's wild adventures around the world, go to www.NormSchriever.com or email him.